We aren't able to survey these flight prices yet as domestic airlines only release prices 9 months in advance. In the meanwhile you can use the booking engine on the left to find current fares. May marks the end of Autumn and hopefully brings more rain to drought-stricken Cape Town! The month starts off with very expensive flights on most routes as the 1st is Worker's Day and a public holiday. The following Wednesday is also a very expensive date to travel on as many people are extending their long weekend. Look out for cheap flights below as the dates are highlighted in green. Try to avoid Wednesdays where possible as it is the most expensive day of the week to travel on. Avoid travelling on the 1st, Worker's Day, at all cost as it is by far the most expensive date to travel on. 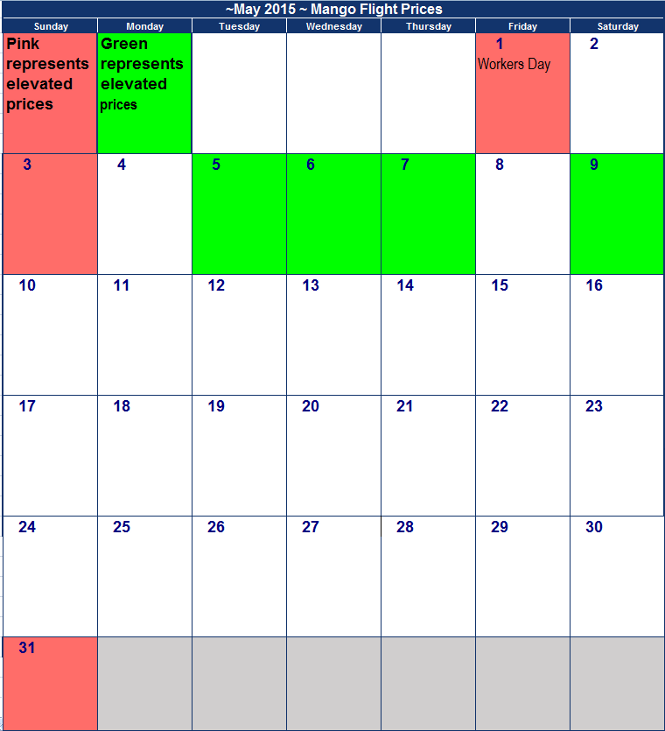 If you are travelling on a budget you should consider travelling on a Tuesday or Wednesday highlighted in green. Avoid travelling at the start of the month if you are on a tight budget. Affordable flights are readily available throughout the month. Flight prices don't fluctuate much on this route, but best avoid the 1st and the 2nd if possible. Weekend flights and Monday flights are the cheapest, so if you are on budget try to fly on a Saturday, Sunday or Monday. If possible, try to travel during the second half of the month when cheaper flights are more readily available. Find the most affordable flights Mondays to Thursdays and on Saturdays. Avoid Friday and Sunday flights where possible. With careful planning, this could be a cheap route to travel on if you avoid dates highlighted in pink. If possible, travel on dates highlighted in green as those are the cheapest travel dates. May is traditionally a quiet month in South Africa, during which most students are focused on exams, but this time it is off to a busier start. The sequence of public holidays taking place on April comes to an end on the 1st of May 2017, which means that quite a few people will be making their way home after a brief break. The consequence is more expensive flight prices on that date and spilling over to the 2nd as well. It does take a turn, with flights becoming more affordable during the second half of the month. Don't forget that Mother's Day is taking place on the 14th of May 2017. We'd suggest a flight ticket for mom to come visit as nothing really beats some quality time together. Find the cheapest days to travel on below and plan accordingly. Try to avoid Fridays where possible as it is the most expensive day of the week to travel on. Avoid travelling on the 1st at all cost as it is by far the most expensive date to travel on. Avoid the 1st as it is the most expensive day of the month to travel on. You can save a signigicant amount of money by travelling on one of the dates highlighted in green if you are flexible. Affordable flights are readily available throughout the month, but best avoid Saturdays if you're flexible. Flight prices don't fluctuate much on this route, but best avoid the 1st if possible. Weekend flights are the cheapest, so if you are on budget try to fly on a Saturday or Sunday. Find the most affordable flights on the 9th, 16th, 23rd and the 30th. If possible, plan to travel on either the 16th or the 23rd as those are the cheapest dates to travel on. With careful planning, this could be one of the cheapest routes to travel on. Prices fluctuate on Fridays. If possible, avoid travelling on dates highlighted in pink as those are the most expensive travel dates. May usually signifies the start of the first heavy rain, which will hopefully bring some relief to some of the drought stricken areas (at least the parts that get winter rainfall). The 1st of May, or Workers' Day, is on a Sunday so the subsequent Monday is also a public holiday! As many will take advantage of the long weekend, flight prices are elevated around those dates. Prices are otherwise fairly consistent on most routes as there are no major events taking place and school is still in full swing. This is your chance to save on Mango flights from JHB to Cape Town! Generally weekdays are the cheapest to travel on this month. Mango flights from Cape Town to JHB : You can save a lot of money by travelling on the 28th of May if possible as that is the cheapest travel date. Mango airfares from Lanseria to Cape Town are relatively consistent throughout the month, but all the cheapest fares are available around the end of the month. Mango flights from CPT to Lanseria if possible don't travel on the 1st or 2nd as those are the most expensive dates to travel on. Mango flights from JHB to Durban are pretty similar throughout the month, with the only date to avoid being the 27th of May 2015. Mango flights from Durban to JHB are fairly level throughout the month with the most expensive flights around Worker's Day. Avoid flying on Mango from JNB to George on the 6th, rather travel the day after which happens to be the cheapest date to travel on! 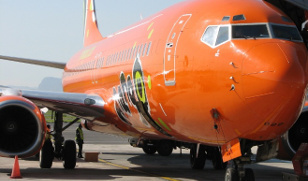 Mango flights from George to JNB are generally affordable, but avoid travelling on Workers' Day. Mango flights from CPT to Durban are very consistent throughout, but avoid travelling on the 2nd or the 27th of May if possible. Mango flights from Durban to CPT: Cheap flights are scattered throughout the month, but can usually be found on Saturdays. Mango flights from JHB to Port Elizabeth: Don't travel on the 2nd or the 31st of May if you can avoid it. Most other dates are fairly affordable. Mango one-way flights from Port Elizabeth to JH: Avoid travelling on or around the public holidays where possible. Workers can rejoice as May brings a public holiday just for us, Workers' Day. So on the 1st of May we can all pull the covers tighter as no alarm is set for work. This year the first falls on a Friday, making the last week of April a short 3-day work week. So if you've got three days' leave available you can create a mini-holiday otherwise you'll have to settle for a three day weekend. You'll be able to notice the influence of the new low cost entrants to the market, Skywise and FlySafair. Their affordable airfares have lead to other airlines like Mango offering very competitive airfares. You'll want to avoid travelling on the 1st, 3rd and 31st of May 2015. Note that the below list of 1-way flight prices was set up on the 1st of April 2015, and airfares may have changed since (the longer it is since the date the airfares were set up, the greater the chance that prices have changed). Check at Mango what the latest airfares are; and click here to see whether there are any flight specials on the go at the moment. This is your chance to save on Mango flights from JHB to Cape Town! If you're not looking to travel within the first few days or the end of the month, you'll be able to score with flights for around R500. Mango flights from Cape Town to JHB : Try avoid flying back on the 3rd of May (after the long weekend) and you should be able to get reasonable priced flights. 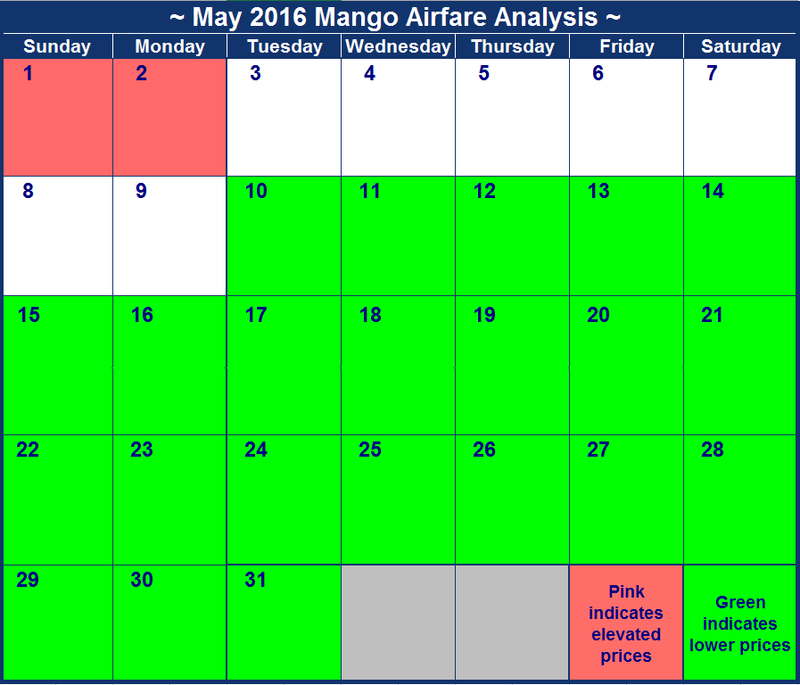 Mango airfares from Lanseria to Cape Town are very consistent throughout the month. Just avoid flying on the 1st! Mango flights from CPT to Lanseria are elevated on the Workers Day long weekend. Flights to OR Tambo are generally more affordable. Mango flights from JHB to Durban are pretty similar throughout the month, with the only date to avoid being the 29th of May 2015. Mango flights from Durban to JHB are fairly level throughout the month. Avoid flying on Mango from JNB to George on the 1st of May, but prices are very affordable throughout. 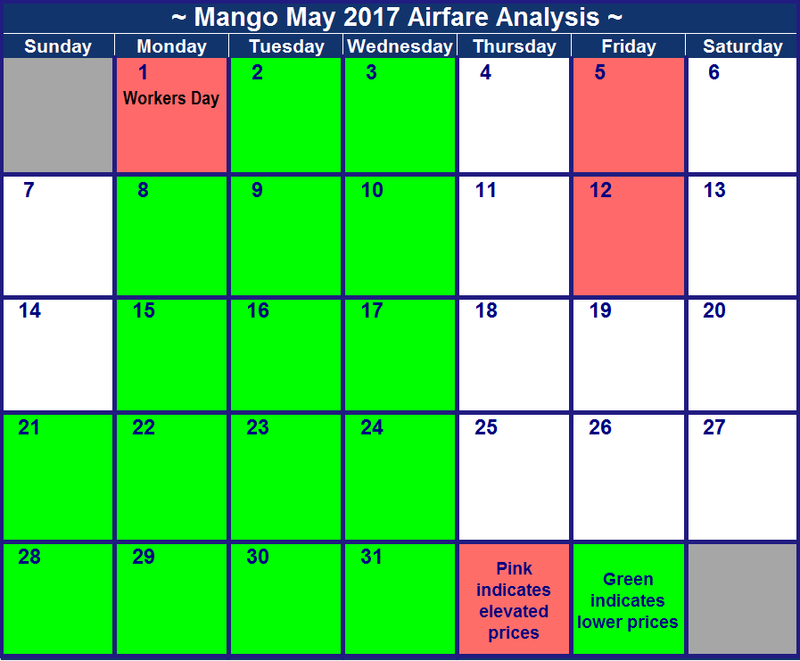 Mango flights from George to JNB are strangely elevated on the 4th and 10th of May, but the rest is relatively similar throughout. Mango flights from CPT to Durban are elevated around the Workers day long weekend, and there are some cheaper flights in the week starting the 18th May. Mango flights from Durban to CPT are elevated around the Workers Day long weekend, with cheaper flights in the last 2 weeks of the month. Mango flights from JHB to Port Elizabeth are slightly more expensive on Sundays. Mango one-way flights from Port Elizabeth to JHB are affordable throughout, but you should avoid returning from the long weekend on the 3rd. Mango flights from Cape Town to PE are most expensive on Sundays. Mango one-way flights PE to Cape Town : Avoid travelling on the 31st of May 2015. There is but one public holiday in May, and that is the famous Workers Day holiday on the 1st of May 2014. 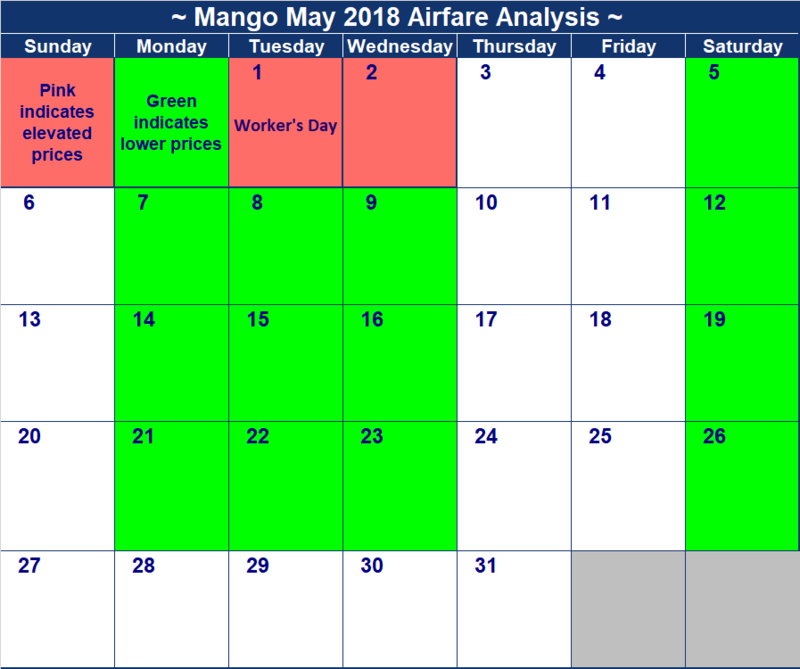 As 1 May 2014 falls on a Thursday, many people are putting in sick leave and turning it into a long weekend, Mango flight prices are slightly elevated around that weekend. On other dates it varies a lot by flight route, with the weekends already coming into play with elevated airfares on some routes (e.g. between Johannesburg and Port Elizabeth). Note that the below list of 1-way flight prices was set up on the 5th April 2014, and airfares may have changed since (the longer it is since the date the airfares were set up, the greater the chance that prices have changed). Check at Mango what the latest airfares are; and click here to see whether there are any flight specials on the go at the moment. It's pretty even-stevens at the moment for Mango flights from JHB to Cape Town in May 2014. Our guess is that this will change, and probably airfares will increase around the 1 May public holiday. Mango flights from Cape Town to JHB : Try avoid flying on the weekend after the 1 May public holiday. Mango airfares from Lanseria to Cape Town are fairly level, like JNB-CPT, although they're a bit lower on the 7th of May 2014. Mango flights from CPT to Lanseria are elevated on the Workers Day long weekend, as for CPT to OR Tambo. Mango flights from JHB to Durban are pretty low across the month of May 2014, with the exception being the Friday flights. If you're going to go away for a long weekend, try the 16th to the 18th May 2014. Mango flights from Durban to JHB are fairly level, except for Sundays, when they're elevated (Gautengers returning home from their weekend's break). 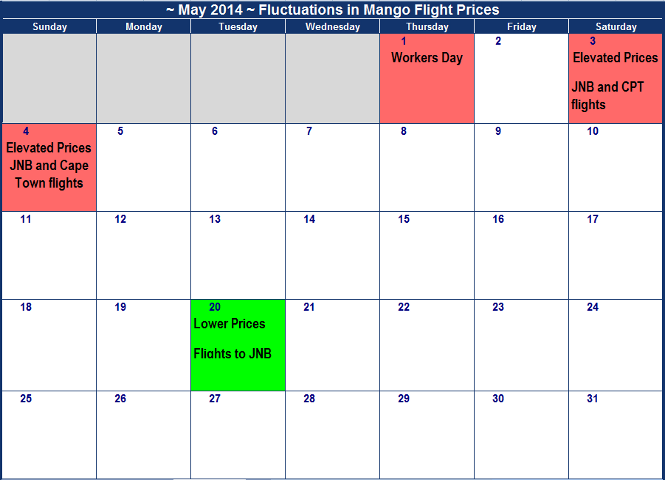 Mango flights from JNB to George are elevated on the 23rd and 30th of May, for reasons not entirely clear to us. Mango flights from George to JNB are elevated around the Workers Day long weekend. Mango flights from JHB to Port Elizabeth are elevated on Fridays and Sundays. Mango one-way flights Port Elizabeth to JHB are higher on Fridays and Sundays. Mango one-way flights PE to Cape Town : Try avoid flying on the 4th of May 2014.